The pope met with Kim Davis, and a hurricane is coming: The Wednesday Slatest. 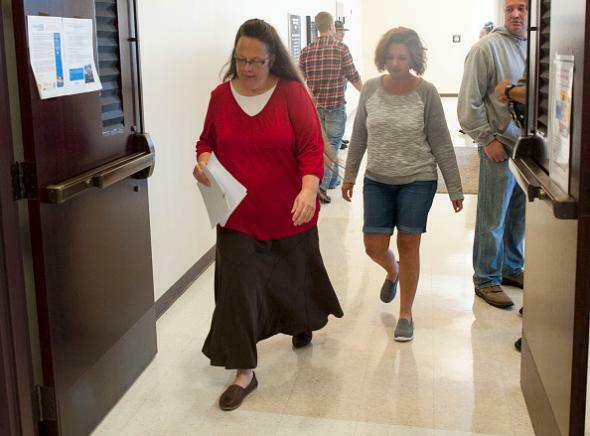 Kim Davis at the Rowan County Courthouse in Morehead, Kentucky, on Sept. 14, 2015. Hello, Slatest readers! Here be the Wednesday news. Hurricane Joaquin is threatening to rock the East Coast like a hurricane. Pope Francis, he of the un-pin-downable politicial ideology, turns out to have met with right-wing hero Kim Davis during his visit to the United States. He’s also asked Oklahoma’s governor to stop the execution of Richard Glossip, who may be innocent. Meanwhile, a woman named Kim Gissendaner who had become a respected in-prison minister was executed in Georgia. South Carolinan Benghazi gadfly Trey Gowdy may be angling to take over as Speaker of the House—or he might be quitting Congress. Who knows? Afghanistan is in a state of particularly chaotic Afghanistan-style bloody chaos right now; here’s why.